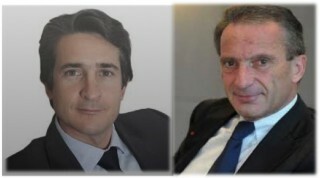 At the meeting of the Board of Directors on 23 December 2014, Patrice Caine, ex chairman and chief executive second-in-command, and Henri Proglio former EDF chief, were co-opted as directors, following the resignations of Philippe Logak, who had served as Acting Chairman & Chief Executive Officer since the departure of Jean-Bernard Lévy, and Stève Gentili as independent director. Patrice Caine was subsequently elected to the position of Chairman & Chief Executive Officer of Thales. As such, he will prepare the separation of the role of Chief Executive Officer, which he will hold, and the role of Chairman of the Board, which will be held by Henri Proglio. Both appointments will be confirmed by the next Annual General Meeting due on Feb. 4, which shall also approve the changes to the company’s articles of incorporation. The two main shareholders of Thales are the French Government, through TSA, and Dassault Aviations, bounded by a “sharehorders agreement”. Thales’ board has 16 members in total. Economy Minister Emmanuel Macron accepted that Proglio, seen as close to the Dassault family, would replace one of the five directors representing the state rather than one of Dassault’s four directors. Mr. Caine, an X-Mine Engineer, was responsible in particular for the implementation of the competitiveness of the group improvement program. The appointment of Patrice Caine should have the virtue to reassure internally, while the group is in full deployment of its growth strategy and internationalization. Unions but also Apat, the association of employee shareholders of Thales, had indeed claimed that the new boss is from the group in order to ensure continuity and ensure its stability. All keep in mind the difficult episode of the chairmanship of Luc Vigneron, characterized by a detestable social climate that Jean-Bernard Levy had sought to appease the past two years … in precisely pressing Patrice Caine. He had made his right arm, with the title of general manager in charge of operations and performance. Patrice Caine and had the largest portfolio of business after the CEO, operations but especially the “Ambition Boost” program to improve the profitability of Thales. For this, it has strengths: his knowledge of the house and his managerial qualities, but also its proximity and listening skills. “Brilliant, end accessible” are the adjectives that come up to her. It also goes well with the unions, with whom he strived to finally turn the page Vigneron.